Own it on 4K Ultra HD, Blu-ray & DVD Now. 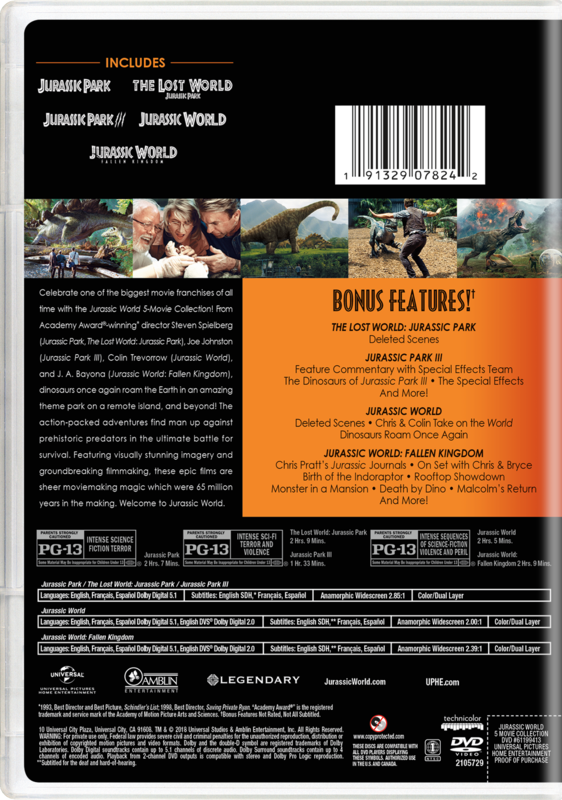 Celebrate one of the biggest movie franchises of all time with the Jurassic World 5-Movie Collection! From Academy Award®-winning director Steven Spielberg (Jurassic Park, The Lost World: Jurassic Park), Joe Johnston (Jurassic Park III), Colin Trevorrow (Jurassic World), and J. A. Bayona (Jurassic World: Fallen Kingdom), dinosaurs once again roam the Earth in an amazing theme park on a remote island. The action-packed adventures find man up against prehistoric predators in the ultimate battle for survival. Featuring visually stunning imagery and groundbreaking filmmaking, these epic films are sheer moviemaking magic which were 65 million years in the making. Welcome to Jurassic World.